My parents met in Bath during the early days of World War II. My mother was a Bathonian, born and bred; my father was posted to Bath with the Admiralty, which he’d joined as an 18 year old in 1941. My mother reputedly had many suitors in her youth but my father was more persistent than most. Whilst others fell by the wayside, he wrote to her frequently throughout his wartime service with the Fleet Air Arm whilst she was, by her own account, enjoying her war in the Land Army. When my father returned to Bath, after refusing him twice, my mother finally accepted his proposal of marriage which he made in the back of a taxi as they travelled home from the theatre one night. 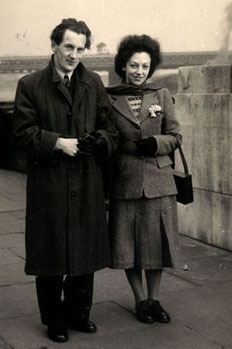 They were married in Bath the day before my mother’s 24th birthday, on 24th February 1949. Six months later, my father sailed to Sri Lanka (then Ceylon) to take up a post at the Royal Naval dockyard in Trincomalee. My mother joined him in April 1950, travelling out on the SS Himalaya. So, I was born at 1.30am on Wednesday, March 7th 1951 in the Royal Naval Hospital at Trincomalee. For the first few days of my life I was nursed by an ayah who, I’m told, greatly amused herself by pulling my ears. Luckily for me, and my ears, my parents decided to return to England in the July and we sailed on the RMS Strathmore. We settled in Bath for a while and lived in Grove Street, in a cramped little flat over a flower shop called Caudle’s. My father worked and my mother stayed at home to look after me. Most days we’d go to a greengrocer’s shop called Adam’s which was in Argyle Street, off the Pulteney Bridge. I can still conjure up an image of the shop; each shelf meticulously laid out with dozens of tins and packets, jars of sweets, bunches of flowers in tin buckets, wooden crates of tissue-wrapped fruit, vegetables piled up in wicker baskets on the floor. I’d be put on a high wooden stool and sometimes given a chocolate biscuit to keep me happy whilst my mother chatted with the shopkeeper. His young assistant would scurry round the shelves collecting the things that we wanted and put them into a cardboard box to be delivered later. Every Monday was washing day – our kitchen was “like a Chinese laundry” according to my Dad, with tubs of soapy water bubbling away on the gas rings filling the flat with steam and the fragrance of washing powder. I can remember the ‘Dolly blue bag’ sitting on the sink, trickling blue dye – I think somehow it made the laundry extra white. My mother used a mangle to squeeze out the water and then she would drape everything all over the place because we didn’t have access to a garden. The ironing would be done on Tuesdays in the day time – not much choice because the iron was plugged into the kitchen light socket! My mother’s parents were born in Bath and when I was a child, they lived in a large detached house in Bloomfield Avenue. Sometimes I’d visit or even stay a few days, which I always enjoyed. I have surprisingly strong memories of one particular day in 1953 – sitting cross-legged on the floor in the lounge, staring at a tiny screen set in a huge mahogany cabinet; the fuzzy black and white picture magnified by a thick convex lens. My grandfather was probably one of the first people in Bath to own a TV set – he loved gadgets. Well, on this day the room was filled with adults, there to witness a technological marvel – the coronation of Queen Elizabeth II – probably the most ambitious live outside broadcast made by the BBC up to that point. As a two-year old sitting with my cousins, hushed to silence no doubt, I had no idea of what was going on but it still made a lasting impact on me. During WWII, ‘Baedeker’ bombing raids on Bath were carried out by the Luftwaffe in retaliation for the destruction of the historic city of Lübeck by the RAF. The city was of no great strategic importance but, as was the intention, was targeted for its historic and architectural beauty. The raids occurred on the nights of the 25th and 26th April1942 and bombs were dropped along the vertical and horizontal axes of a cross drawn on a map of the city. At the centre of this cross was the area of Kingsmead which, being hit twice, was severely damaged. My grandfather had a fish and chip restaurant at 38 Kingsmead Street and had only just moved the business from across the road at 10 Kingsmead Square. He’d had a new plate glass shop window fitted and a reinforced floor put in, enabling the basement to be used as a public air raid shelter. He and his family escaped death by a hair’s breadth on the first night of the blitz. Fortunately no-one was injured but the front of the shop was blown out and was considered unsafe so the family were evacuated to Bradford-on Avon, along with Mr Betts, their neighbour who kept a shoe shop. His was the last building left standing on that side of Kingsmead Street and remains so today. My grandfather resumed the business after a few months and it stayed in the family until he died in 1966. At some point in the 50’s, Bath and my much loved grandparents were left behind us as we started travelling. Our ‘grand tour’ of Britain took me to so many different houses and schools that my brain recorded very few childhood memories after the age of five and so I can’t really recall names, places or dates very well. I do know that when I was about twelve we returned to Bath and I went to the City of Bath Girls School for a year or two. There were ‘houses’, a bit like Hogwart’s School in the Harry Potter books, but instead of Hufflepuff and Gryffindor, our house names were Long, Roxburgh, King and Sarah Grand. I was in Long and wore a round mauve house brooch – healthy competition was encouraged! The head, Miss Winifred Cook, was a caricature of the strict public school mistress – a tall woman with her hair pulled back into a bun and of whom I, like everyone else including my parents, was terrified. In early March 1964, Miss Cook uncharacteristically granted the school a half day off – if she hadn’t we’d have scarpered anyway. To a girl, we were off to Oldfield Park junction, a railway halt just down the road from the school. Rather magically on this day, the already world famous pop group, the Beatles, made a brief stop here on their way from London to Minehead during the making of their first film “A Hard Day’s Night”. They bravely left the safety of the train and stood on the tiny platform surrounded by yelling, hysterical fans. I managed to touch my hero, Paul McCartney on his jacket – I’ve obviously never forgotten that moment but I imagine that Sir Paul probably has. Much though the conditions at the school were austere, I was sad to leave but we were off again – back to the seaside town of Weymouth. Going to a mixed school was a real shock and I didn’t like Weymouth Grammar School one bit. Academically, the move was a disaster and in 1968, after two attempts, I managed to scrape just four GCE ‘O’ levels which even in those days, qualified one for little more than a life of clerical obscurity. A year beforehand I had left home and was living above a little restaurant called the Sea Cow Bistro, which was by the quayside in Weymouth Harbour. I worked there at weekends and, after I had left school, in the evenings as well. The place was very fashionable; tables covered with red and white chequered tablecloths, moodily lit by candles planted in wax covered Chianti bottles – it was chic and very much of its era. Beatles records were played non-stop every evening – ‘Revolver’ was my favourite. We’d sometimes have celebrities come in to dine – ‘Far From the Madding Crowd’ was shot near Weymouth and several times the actors and crew filled our tiny restaurant, staying until the wee small hours. I managed to secure myself a walk-on part in the film but, having watched it since, caught only a glimpse of one shoulder! Despite these happy times, I eventually spread my wings and moved away from the town in which my parents still lived to go back to Bath, my ‘adopted’ home. In a local junk shop I exchanged my antique, wind-up gramophone and collection of 78rpm records for two second-hand suitcases and then I hit the road. Once in Bath I found myself a room in a shared house but, after a few months, I moved into a single bedsit which was on the third floor of 11 Laura Place. I paid £3 a week rent, about a quarter of the average weekly wage at that time, and I thought it was a palace although it was just one room with a tiny Baby Belling single ring cooker and a sink in the walk-in kitchen cupboard with a shared bathroom across the landing. Through my sash window, though, I could see the River Avon, running under Pulteney Bridge and over the weir. It was an exciting place to live and 1969 was to be an exciting year. In June, the first Bath Festival of Blues and Progressive Music was held in the city. Despite the fact that I lived just around the corner from all the activity I spent the night before the event sleeping on a bench in the Abbey Churchyard along with all the other festival goers just to ‘get into the groove’. Seeing live music performed for the first time made a big impression on me and so it was with great anticipation, but no money, that I went that August to the Isle of Wight Festival of Music. The main act was Bob Dylan but the whole line-up over the three days read like a who’s who of contemporary rock and blues. I slept under the stars, with 35,000 other people, listening to the music, living on doughnuts and cups of tea. It was a life-changing experience and one that I will always remember, if not in every detail then at least in essence. For quite a while I was seduced by ‘flower power’ and, like my contemporaries, wore tie-and-dye T-shirts, bleached jeans, beads, pale panstick makeup and long hair. 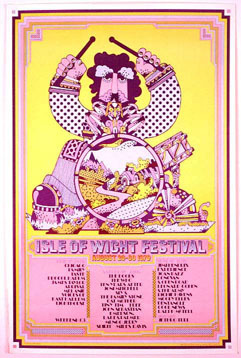 The following year I returned for the IOW Festival of 1970 which was thought, by some, to signal an end to the ‘age of innocence’. Some folk objected to paying for tickets and tried to break into the performance enclosure but the promoters stood to lose a lot of money and so there was violence and ill feeling. In any event, the musical line-up was even more impressive than it had been before and, with an attendance of about 600,000 people, exceeded any other single musical event before or since, including the legendary Woodstock. In July, I rented my very first black and white television just so that I could watch the first manned space walk from Apollo 11. I was the only person in the building who had a TV and so I invited everyone to come and watch in my bedsit. Fourteen people sat on my divan bed that night and the legs gave way. Not surprisingly, my landlord found the explanation for the breakage a little implausible and charged me for the repairs! Three months later, unemployed and broke, I was walking along in the city centre and it started to pour with rain. I had no coat and so was in for a soaking. I ducked quickly inside an open doorway to wait it out. Whilst I was standing around I looked at some of the posters on the wall…. “If you like solving crosswords and reading Agatha Christie novels then we have just the job for you”… with an invitation to go upstairs and find out more. By the time I left the building not only had the rain stopped but I’d joined the Army! The poster was advertising the job of cryptanalyst – a code breaker in other words. On the 2nd November 1970 I joined the colours and went to the Queen Elizabeth Barracks, Guildford where the W.R.A.C. training centre was then situated. After weeks of square bashing and months of trade training in Aldershot and Loughborough, as Pte W/439151 I qualified as a cryptanalyst and was posted to 13 Signals Regiment, BFPO 40, Mercury Barracks, Birgelen in West Germany. I had the time of my life, enjoying the camaraderie of living and working with others, something I’d never experienced before, being an only child. I particularly liked to travel home in my smart green uniform, designed by Norman Hartnell apparently; peaked cap and bottle green double breasted greatcoat with brass buttons. I was proud to wear it and I have to admit that I rather enjoyed the attention it brought me and the connection that I felt with other service people that I met on my travels. Before the Irish Republican Army launched terrorist attacks in mainland Britain, soldiers, sailors and airmen were a common sight in public but eventually, civilian clothes had to be worn in public places and service personnel became unidentifiable. I was in Germany during the Cold War, when allied forces maintained the peace and nuclear war, we were often told, could break out at any time. 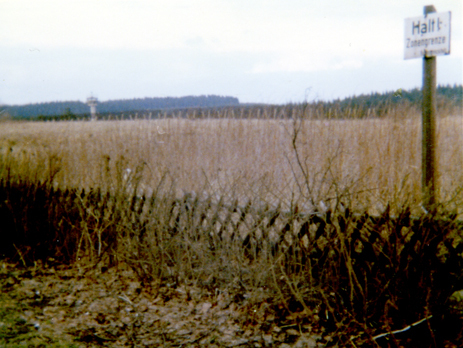 I once travelled to the Hartz Mountains and saw the East-West German border, erected after the war. I’d expected it to be more substantial but it was just two low wooden picket fences separated by No-Mans Land, stretching as far as the eye could see. Strange that a country could be divided this way but the manned guard towers and flower strewn roadside memorials were testament to the barriers’ effectiveness. One achievement of which I was proud during my time in the army, apart from riding a horse, jumping out of a plane and learning to glide, was taking part in the Vierdaagse, or Nijmegen March, an annual endurance event which has taken place in Holland most years since 1909. This is now said to be the world’s biggest march and every year attracts many thousands of entrants from military teams and civilians alike. In July 1971, in fierce heat, our squad from 13 Signals Regiment marched 25 miles each day for four days running. It was a punishing ordeal and I’m happy to say that I didn’t even get a blister! On the last day, each successful marcher was awarded an official Dutch medal at a grand ceremony in the town square and we were also given a gladiolus, the flower of Nijmegen. Not all my military service was marked by glory however. I was a bit of a prankster and often led others in the commission of practical jokes. One night, because we were fed up to the back teeth with a girl in our dormitory that snored loudly, we pushed her bed into the middle of the vast parade ground and left her there, still sound asleep. In the morning we were treated to the sight of one sleepy, disoriented soldier struggling to cover her modesty with a sheet whilst hobbling back barefoot to the block. After I left the army I went to live in London. By now it was 1973 – Britain had joined the Common Market and also, whilst I was in Germany, had adopted decimal currency. The ‘mods’ were a thing of the past and ‘hippies’ were almost considered mainstream. I was glad to be back in bedsit land even though I was at the mercy of some real rogue landlords – life was sometimes a bit like a ‘60s Nell Dunn novel, rather monochrome and a bit depressing. One bedsit I had, at Sumatra Road in Kilburn, was very tiny with a single bed and kitchen dresser in one room and a bath and gas cooker in the other. The geyser over the bath terrified me – when I turned the hot tap on, blue flames would leap right across the room. The close proximity of the bath to the stove was useful, though, since I could bathe and cook tea at the same time. The toilet was a brick built outhouse at the end of the back yard, next to the railway lines. When high speed trains went through to Paddington everything in the kitchen would rattle and crockery would threaten to fall off the shelves. One summer morning I awoke very early and had to use the ‘facilities’. On my sleepy way back up the garden path, I had the sense of being watched and turned round to see a stationary breakfast Pullman in which sat several men, forkfuls of egg and bacon halfway to their mouths, slack jawed with surprise. I had forgotten to put any clothes on. Eventually, I was drawn back to Bath again and returned in 1974. By now I was 23 – I found myself a flat and applied for a post as a cytologist in the Royal United Hospital. I’d been doing this job in the Middlesex Hospital in London, and I’d expected to be able to apply successfully for the same post in Bath. The job involved examining stained microscope slides, looking for cancerous cells in patient’s samples. I’d proved reasonably adept at this but at Bath, previous experience and my four ‘O’ levels were not enough and I was turned away. Enrolling on a correspondence course, I crammed night and day and managed to pass three more ‘O’ levels a few months later. I returned to the hospital, asked for a job again and this time was successful. I worked as a cytologist in the Area Central Laboratory from 1975 to 1979 and, during this time, I also progressed from living in a furnished bedsit to having an unfurnished flat. I had a good social life and was drifting in and out of relationships but life was not particularly challenging or exciting. I had entered a state of ‘anaesthesia’ where the years could have slipped by almost without being noticed had I not, in an impulsive moment, joined the Wiltshire Constabulary in June 1979 and become WPC 829. Life in the police was hard by any standard – unsocial hours, anti-social people, violence, anger, ignorance and fear – and in those days there was no counselling for officers who’d experienced traumatic events. On the plus side, Prime Minister Margaret Thatcher dramatically raised police pay soon after I joined and I was given a police house for which I paid only nominal rent. My standard of living went up and by 1980 I earned nearly £10,000 a year, which was probably above average for the time. In 1979 the police had taught me to drive so that I could man a patrol car and cover a rural beat so I bought my first car at the age of 29, quite old by today’s standards no doubt. It was a white Austin Mini 1000 with an ‘L’ (1972) registration which cost me £750. I lavished much attention on it and it lasted quite well until becoming overcome by rust. No car came close to my affections after my first love! Amongst the day-to-day grind, I was involved with one event of national importance. The anti-Cruise protests at RAF Greenham Common started in September 1981 and were to last for 19 years. Women chained themselves to the fences at the RAF base and refused to move until plans were changed to host US missiles on British soil. I was sent there a few times to help keep the peace between the protesters and RAF personnel. Things were generally calm and the women were good natured, but strong willed. Many had left homes and families behind them to spend years rough camping at the roadside – similar determination to the women suffragettes who had changed history earlier in the century. Death is a familiar concept to police officers as they deal with road accidents, suicides, cot deaths, sudden deaths and occasionally even murder. It’s hard for people to imagine that there might be a funny side to this gloomy subject but it existed. During one very heavy winter, the roads were impassable and covered in deep snow drifts. I had a rural beat around Devizes and I’d had a ‘shout’ – I was asked to investigate a report from a lady who’d been unable to contact her elderly, housebound mother who lived in a remote cottage. The postman had tried to raise her too and they feared that the old girl had perished from hypothermia. A snow plough before me, I skidded along in my van and eventually met the postman at the cottage. After banging on the door for some time, I had to break in and we went together around the house, calling out, but answer came there none. I knew that the lady was most probably dead and told the postman to wait downstairs whilst I went up but he followed me. We found the body lying in bed and I went over, pulled down the covers and started my examination whereupon the body sat up abruptly, looked at me and said “Hello my dear”. I heard a faint sigh and a thump behind me; I wasn’t that composed myself. When he recovered, the postman left me to explain to the poor woman why I’d broken her front door down in the middle of a freezing winter’s day when she’d had the good sense to stay in bed and keep warm! Humour aside, the stresses and strains of ‘the job’ had a very detrimental effect on my health and, when my nerves finally snapped, I was awarded a pension and honourably discharged from the force. I moved to Swindon in the summer of 1985, because housing was cheaper there; I found a post with Thames Water and was trained to be a water quality scientist. My job was to perform biological and chemical testing of potable drinking water to which end I would sample reservoirs, bore holes, rivers and pumping stations and then test the samples which I’d collected. It was interesting enough work and I enjoyed it for four years; the water quality laboratory was at a pumping station in Latton, a little village between Cirencester and Swindon. Because at one point I’d also trained as a computer programmer, I set up a network system for the lab and could have progressed in the company but I’d hit the ‘glass ceiling’. My lack of education was holding me back from career progression – not that I’d stayed in any job long enough to progress anyway! By this time I was 35, had been out of education for many years and considered myself to be a lost cause. Then I discovered the Open University. By 1989 I’d been happily studying with the OU for four years and was doing OK with my exams, which made a pleasant change from my experiences at school. But life was to change yet again. I went with a friend to Oxford one afternoon to meet some other friends and share a birthday meal with them. I was musing aloud at how lucky the students at Oxford were, how they were so privileged studying full time and in such perfect surroundings. My friend retorted “Well, why don’t you go to university then?” I thought she was mad but it sparked my curiosity and the following week I went to see a tutor at Bath University. I turned up in jeans and a T-shirt with some of my OU stuff under one arm. At the end of our chat, much to my surprise, the tutor said “I’m happy to offer you a place in October” and shook my hand – I didn’t even know that I’d been interviewed by the admissions tutor! So, in my usual impulsive fashion, I got a mature student’s grant and studied for an honours degree in Applied Biology. I lapped up the academic lifestyle and fitted in with my fellow students far better than I’d ever managed at school, even though they were all twenty years younger than me! In the third year I did a twelve month placement with the Metropolitan Police Forensic Laboratory at Lambeth, which was truly fascinating. I paid a visit to the Black Museum, something that the public cannot do. Here I saw the actual exhibits and photos from real crimes: Jack the Ripper, John George Haigh, Hawley Harvey Crippen, Reginald Halliday Christie and many more. I was in my element. After the degree I stayed on at Bath and did a PhD. I enjoyed study and science so much and wanted the chance to work in a laboratory and do my own research – at last my glass ceiling was broken. By the time I’d finished full time study I was 46. My speciality was neuroendocrinology – studying the hormones of the brain and pituitary gland, and my first post-doctoral position was in Edinburgh Medical School. I fell in love with the city and the two years passed too quickly. I lived in a little furnished one room bedsit, about the same size as the one I had in Laura Place back when I was just 19. The difference was that this room cost me £350 a month, nearly thirty times more expensive! At the end of the contract my boss had no more grants in the pipeline so, reluctantly, I had to take the next post that came my way, which brought me to where I am today – Cardiff. I’ve always had mixed feelings about living here – I have met some extraordinarily nice people but I’ve also experienced some tough times too. But more than ten years later I’m still here. After completing a research contract in 2003 I reached another crossroads. A long term relationship had broken up and I’d received a sizeable chunk of money, proceeds from a house sale. For the first time in my life I had capital and choices to make: invest or spend? I could either buy a bigger flat or I could do something more interesting. I opted for the latter. I sold my flat, bought a caravan and moved myself into it. A nice young student, with whom I was working, wanted very much to find somewhere quiet to live whilst she was writing up her PhD thesis. I, on the other hand, wanted someone to look after my possessions and my cat, Ralph. We came to an agreement, the student became the house/cat sitter and I paid the rent. I looked on the internet for the longest, most exciting and affordable travel experience that I could find and found ‘Exodus’ a travel company which specialised in overlanding; travelling by truck across many miles, camping and seeing foreign parts at ‘ground level’. So I went on an adventure which lasted for eight months and took me to ten countries, starting in India. It would take several books to describe all the wonderful sights and experiences that I had on the road. Travel showed me how volatile and changeable the world is. As we passed through there was an assassination in Nepal, terrorism in Mumbai and war in Afghanistan. And yet the travel was thrilling and I was severely ‘bitten’ by the travel bug. I took up photography and started trying to capture what I saw in these places – perhaps, in another life, I would have been a journalist, or a photographer, or a best-selling author, or a naturalist or…. These stories are just snippets of my life and do not describe more than a few highlights along the way. Many important world events have occurred during my tenure on this planet. There were wars in the Falklands, the Gulf and the Middle East. Presidents were assassinated and Royals died; some in tragic circumstances. Men walked on the moon and landed the shuttle like an aeroplane. Calculators and computers were invented and the microchip revolutionised our world. Now, instead of writing an air mail and waiting a month for a reply I send a text and get an instant response. It’s not all good though. Junk food has turned a lot of kids into blobs and we are sinking under the weight of discarded pizza boxes and drinks cans. Quite bizarrely, computers and mobile phones have replaced writing and speaking for many people. But, all in all, I count myself lucky to have grown up during the times that I did and to have seen and experienced the world in its different moods. What a fabulously interesting, informative and humourous read, found myself wanting to read more and more, so come on Karen, next instalments please! You’ve summarised your life to this present day with great skill, not an easy task and one that lots of biographers, memoir writers have great trouble doing, writers either win the readers’ full attention in the first few paragraphs and leave tham wanting more or lose them completely. Your ” snippets” as you put it, seem to me like a wonderfully laid out introduction or very first chapter of a far more in depth memoir, and I for one want to read on, so I think this little experiment fits in beautifully with your forthcoming retirement. Well done lass-brilliant stuff…. Sharon, thank you so much for your kind and encouraging comments! I am amazed that anyone has read to the end of this lot. I thought I should write something about my life because my memories are also a part of my family’s history – something that many genealogists tend to forget! Karen this is brilliant, fantastic and I want more! It was an amazing idea to have a web site, I hope the family think the same. Keep it coming. I think a book comes next? I think a book would be an excellant idea. Ive got a feeling you mentioned the idea of doing a coffee table book of all the photos +odds and sods ages ago. Id be glad to contribute towards the cost. You could mention it at the party? Gosh – how radical – that would certainly keep me busy in my retirement 🙂 Joking aside, I will give this all some thought – I have some ideas which we can chat about soon! I just don’t know that box, unless it was a puzzle box but that was like a puzzle box made in sections that you had to open in a particular way. I’ll have to see it one day them maybe I’ll recognise it! How much longer can you resist! You have been practicing all your life….your skills as a researcher, all the information you have already gathered. Combined with a passion for the subject and a natural ability to write. Karen – loved the reading – great stuff – I too am an Exodus fan and go off with them far and wide when I can – Trans-Siberian was great. Ive got a small cigarette box somewhere that belonged to your g father I think, A rather fetching little figure pops up when you open the flexible lid, its not very PC in these times, but its a essence of the past. Like you Im a ‘late developer’ in education cant imagine what Ill do when I grow up? I remember that box too, was always facsinated by it as a child. Ive got 1 very large glass jar that belonged to Nan, she used to keep sultanas in it.I also remember the dumb waiter. Hi my name is David Tuffin and I am a researcher at Sherborne Museum and I found your information about Ridout’s Mill and Hyle Farm very interesting. Could you tell me where you got this info from, as we do not have anything about Ridout’s Mill in our archives and would very much like to get more on this subject. Would you mind if I copied some of your pages for research use in the Museum. Thank you for your interest in Ridout’s Mill. I am very happy for you to copy my pages – I would be grateful if you would link to this site in some way as I always welcome contact from interested parties. As for the information, I have been researching my family history for some years and am also lucky enough to have inherited some useful material from a Victorian Ridout genealogist. The information is very eclectic but broadly speaking comprises wills, private family letters, parish records, chancery records and, in particular, Sherborne manorial records (contracts, surveys etc). Between them, I have pieced together my hypothesis about West Mill and the connection with my family. It seems that the mill is crying out for restoration but lacks impetus (and probably funding!). I was interested to read your account of your early days in Bath. I am particularly interested in the fish restaurants/shops owned by your grandfather in Kingsmead Street and Kingsmead Square. Do you have any more information on those, and what was your Grandfathers name? My great grandfather, John Arthur RIDOUT (1863-1953) first opened a ‘fried fish restaurant’ at 132 Walcot Street, formerly the Don Cossack pub, in about 1908. 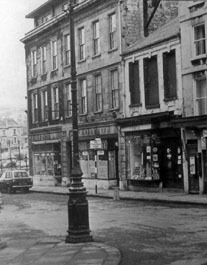 He then started additional businesses, with family members, in Augusta Place (Weston), Claverton Street (Widcombe) and 10 Kingsmead Square, amongst others. His son, my grandfather, Reginald Frank RIDOUT (1891-1966) managed the latter shop at the outset of WWI and on his return from Germany – he remained a fish restaurateur for about fifty years, until his death. In 1942, my grandfather moved his business from Kingsmead Square (where incidentally my mother and her sibling were born) over the road to 38a Kingsmead Street. It had been a sweet shop, I think, but he refurbished the premises and put in a reinforced shop floor, providing structural support for a restaurant below – this came in handy as an air raid shelter and was used as such. On the first night of the Blitz in April 1942, the shop’s brand new plate glass window was blown out by the force of a nearby explosion and the family were forced to evacuate temporarily to Bradford-on Avon. When the business resumed, my grandfather stayed and, over the years, brought his children into the ‘shop’ to help out. As a small child, I was sometimes given a ride in the dumb waiter which was used to ferry food from the shop to the restaurant downstairs. A couple of years ago I went to what is now, I believe, called Seafoods and although the shop and its fittings are unrecognisable, the dumb waiter was still in situ. I have a couple of photographs and a very wobbly black and white cine film, without sound, that my grandfather made from about 1937 and which features the shop and his ‘new fangled’ gadgets like the potato peeling machine and chipper! Hi – there are a couple of RIDOUTs in the Bath Poll book of 1855. Robert & William both victuallers Could they be yours? Iris… Thank you. Not so much proud though, more relieved. Every time a blog is born it is a little piece of our (or in this case, my) story ‘out there’ where I always intended it to be. Have not read in detail, wish to do so later. Geneologists. Am in touch with Orlando Ridout IV of Annaoplis decendant of Son of you Sherborne Miller are you in contact with him? hi Karen. Great website. Just wondering if you know much further about the Scotts? Jacob and Mary married in Trowbridge 1817, and it appears as if Jacob junior married 1845 to Caroline Watts, and must have been alive 1892 according to William Ridout’s obituary, on your site. Cornelius is a strong family name of my Scotts who appear to be the only ones in North Somerset. Jacob senior’s baptism seems elusive, did he die 1848 in Bath or was that his son I wonder. I’ve put a link to my tree on Ancestry. Any news you come across I’d always be interested to hear. Hi David… Glad you like the site – thank you for dropping by! You probably already know that Jacob lived at 5 Trinity Street, Bath – a building pulled down many years ago. He was a paint washer. I believe (but have not proved) that Jacob married Mary GILLETT in Trowbridge on 5th August 1817. The 1841 census shows that both Jacob and Mary were born out of county and the 1851 census records Mary as a widow, born Trowbridge in ~1794. The Bath BMD site shows that a Jacob Scott died in 1848, aged 55 years old, making his likely birth year 1793. The Family Search (LDS) shows a Jacob Scott, baptised 4th November 1792, son of John in Melksham – a reasonable candidate I would say. So, in answer to your question, I think that it was undoubtedly Jacob Sr that died in 1848, not his son. Incidentally, if you did not pick this up from the blog, in 1841 living next door at no 4 was my x3 great grandfather, John Ridout. John’s son William married Jacob’s daughter Mary Ann in 1842.
hi Karen. That’s pretty authoritative and I would agree. I think I do have a spare John Scott (same name as Jacob’s father), who witnesses a wedding in 1789, Ditcheat, but will try to find some other home for him, as I think the Melksham family were separate, but we shall see. Kind regards, David PS there is information on Ancestry trees which suggests Jacob jr’s wife ‘remarried’ to George Dix and had a large family in Wales starting 1851. Some unanswered questions there! I loved your ‘snippets’ and agree there is a book in there somewhere! I don’t think I connect with the Ridout family, but I used to live in Bath (I now live in Yeovil) and my parents had their first flat in Bath when they were married. I have also moved around quite a bit and studied with the Open University. I will be fascinated to read your blog. My name is James William Ridout. My brother and I are trying to learn more about our family heritage. We are in the United States. Our grandfather was William James Ridout born in Dorset, England. My brother has traced our history back to William Ridout 1550. After reading your post regarding “exploding the myth” and references to John and Thomas Ridout it would appear as though we are long lost relatives. I have a copy of the book Ten Years in Upper Canada and wanted to know more. We have also always assumed our name was of French origin and probably arrived in Britian in 1066. I thought the Ridout name appears in the ” Book of the Dead”. In any event we would love to know more and it appears as though your work mat finally shine some light on just who we are and where we come from. As you can imagine I have never met anyone here in the states with the same name. I know we exist just few and far between. If you know the approximate DOB for your grandfather and/or the town, I might at least find out from which branch of Ridouts he came and then I’ll know if we are related 🙂 I have a fair bit of Ridout data that may help you. Was your grandfather, for instance in any UK censuses?? Hi Peter…. thank you for writing. The facts about Thomas George’s children were found by Bill and I online in Australian records, newspapers &c. I can quite believe that there may be inaccuracies as, being in the UK, I haven’t been able to see the original records as I would normally do before posting information in a blog. I added the last paragraph about Thomas George in an attempt to find you and other Archards in Australia 🙂 I am happy to be corrected over anything and would love to continue a discussion privately. Laura was my great great grandmother – her uncle was Thomas Wyate Archard, your x4 great grandfather. I think that makes us fifth cousins once removed. I am very excited that, for the first time in several years of family history research, I have finally found family outside of the UK. My name is George Bradley Ridout my brother James had inquired about our grandfather William James Ridout. He was born April 1 1894 and is listed in the 1901 census living in Sherborne, brothers Edgar, Lionel, sisters Alice and Anna. Father was George James Ridout and mother Ellen. Any help you can give would be greatly appreciated. Hello, just found your website by accident when I was searching my family name of Ridout. Was really interested to read about your life; it reminded me of things which I had long forgotten in my life. Being of a similar age (born in 1952) it was a real trip down memory lane. I have read a lot of the comments and must say that I am looking forward to the book! I am hoping to research my family tree. Hi Karen What a wonderful site. Well done. The furthest back I seem to be able to trace is to Newfoundland about three generations back. Do you know of any of the Rideouts immigrating from the Sherbourne or Bath area in the late 19th century? I would love to know where my English origins may be. My gggg grandfather Richard Ridout left England about 1814 and settled in Conception Bay, Newfoundland Canada.I’m not sure if I’m related to the above Derek or not. Derek…. where did your Ridout ancestors live in Newfoundland? I have traced my Richard Ridout back to Sturminster Newton, not far from Sherbourne. I believe (but not confirmed) that Richard’s parents were Richard Ridout b. abt 1766 and Susanna Rose b. abt 1766. They had 5 children that I know of, Richard b. 1791/ Edward b. 1796/ Maria b. 1788 and married James Burlton/ Susannah b. 1793 and married Thomas Ridout/ and Thomas b. 1800. I’m wondering if you have any connections to this family or to Sturminster Newton or if you may have any suggestions for research on the above family? Hi Jim … glad you stopped by, although I guess there’s not much about your particular family on this blog, unfortunately. Still, you may be right about having family connections with Derek. Have you tried writing to him directly? (Can you see his email address above?). Yes I’m interested in the DNA project. I was hoping to find one of my Rideout cousins who would like to participate in the ydna testing. How do I join? The page you referenced asks for a kit number. I spotted the link to your blog via the SOG mailing list. What a fascinating account, there has got to be a memoir type book in you! I am a Guildford girl, although I was only little when you were stationed there, I recall though the girls crying as they boarded the trains to start their postings in Ireland, in the days of the bombs and threats from Ireland. I now reside in Devon, not that far from you and will say that RIDOUT is a popular name down here; there maybe a One Name Study for the name (www.one-name.org) if you have links to Devon in your ancestry let me know and if I come across references I will pop them over to you. Nice to meet you too 🙂 Thank you for dropping by and for your nice comments on my story. I am trying to compile a book, using my material on Ridouts from the blog plus much more currently being researched. I think all family historians should include a chapter on their own life, not because it makes blistering good reading but because one’s story is part of the whole history of the family. I ‘inherited’ a lot of data from a fellow researcher; he had transcribed it from papers deposited in the SoG by another Ridout who lived in Victorian times – it would have been nice had that man actually told his own account too! I did my basic training in Guildford in November 1970 and then, after trade training, was shipped out to Germany. Being in the Intelligence Corps, had I gone to Northern Ireland, I would have been in plain clothes and ‘behind the lines’ – it would have been very dangerous but I did volunteer; I was turned down because the powers that be had other idea what to do with me so I stayed in Germany. We did feel very strongly that we should be involved as so many of our mates were killed or injured and I was in Guildford during the pub bombings which killed a chap I knew a bit. All very sad. What are Ridouts doing in Devon I wonder? Having said that, my current investigations MIGHT just show that my line was ‘somehow’ connected to a chap called John RYDOEN, a noble (?Earl) of Exeter so who knows?! The pub bombings were tragic. Ironically years later I met someone who was in the police at the time. Went through the investigations etc. All fascinating accounts. Further coincidence was that I worked for the Prison Service for a time and was “lucky” enough to see the graffiti left by one of those accused and subsequently released for the Guildford bombings. I recall their release and have a couple of books in my Guildford collection. It was a dreadful time and during the early 1990s I worked in London and where it was of course a matter of course to have a bomb scare. Of course now after the events in London and New York the events of terrorism is taken to a different, dreadful and shocking level. More and more coincidences: I was a police officer (in Wiltshire) – not sure which job is tougher, that or the prison service! Also I lived in London, but during the 70s when bomb alerts and actual bombings were quite common – I lived in Kilburn which was a focus for quite a few scares. Never a dull moment! I think that those environments are as bad as each other. I worked within the healthcare arena (married an officer – occupational hazard). Looking back those days were hard work, but I loved the team spirit of it all. The coincidences were something that struck me too; funny old world! Hi John… right…. Arthur James (b. 7 Feb 1882, bp. 9 Apr 1882 St Luke’s, Osney Crescent, Camden) was the son of William Henry Ridout and his wife Eliza Elizabeth (nee DYKE). William Henry ran a coffee house in London until he retired at a relatively young age, at which point the family moved out of the city. Even in 1911, Arthur James was with his parents and worked as a valet. William Henry (1845-1912) was a son of William Ridout (see: https://the-ridouts.com/2011/10/26/the-child-that-was-born-on-the-sabbath-day-william-ridout-1822-1892/). Like you I had a father with wartime service with the Fleet Air Arm and post war followed some of his postings to shore establishments. These were Lee-on-Solent, Worthy Down, Malta and Culdrose in Cornwall, but being 10 years older it is unlikely that we were ever playmates. I very much enjoyed your biography and your Rideout research is brilliant. Thanks for dropping by; I’m glad you you enjoyed the potted biography amd thank you for your kind comments about the blog. Karen; Many thanks for the PDF on “Confusing the Issue,” re the Fisher/Rideout, etc.story. That was quite enlightening. Great blog! Much appreciate your fine detailed work. Eugene Rideout, Windsor, Ontario, Canada. Thanks for dropping by on my blog! I lived in Bath when I was a little kid and then a bit later when I was about twelve; I went to a school in Oldfield Park. My father worked in The Empire Hotel at one point; he was in the Admiralty so I guess your dad was too? I looked for your old school and found it here: http://www.heritage-house-school.co.uk/welcome/ . If you go to Bath I hope you find a nice hotel in the town centre, where it is flat and easier to walk about… I haven’t been home for a while. I enjoyed your writing about the Ridout’s. I knew Bill and thought very highly of him. He is a relative of my wife. Her grandmother was Georgina Ridout. She was from Birhamstead. We were fortunate to stay with Bills and Eunice. I love the countryside and miss this part of the UK. I have discovered a tv show that has been filmed in and around Birkamstead called midsummer murders. I love this show because of the villages that are shown. We miss Bill and Eunice. They were very kind and loving people.